I’m sitting on a plane from the UK to California, taking lots of long slow breaths, feeling tired but inspired from a 12-day trip that feels like I plugged my finger into the sun. Of course mindful breathing also helps when surrounded by a sea of disposable plastic items that comes in addition to the big emissions when we travel by air. 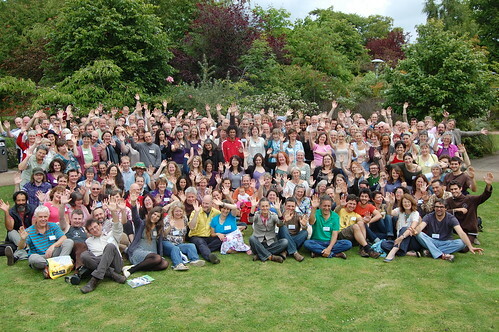 The next day I was on a plane to Totnes where the Transition movement emerged to attend the 5th annual Transition Conference and connect with Rob Hopkins, Ben Brangwyn and the folks who sparked and helped spread this movement far and wide. After no sleep on the plane, a bus and train, I landed in Totnes. With no money exchanged or phone access and all the shops closed, I got pointed in the right direction and started on my way. I probably could have talked a cab into a ride, but where’s the adventure in that? After a couple miles walking through country fields and up small lanes, I found the spot, a lovely Transition household turned B&B operated by Chris and Karen Bird. Chris authored the Transition Sustainable Homes book. I landed just in time for dinner, a glass of wine and a fresh gooseberry crumble! Then after dinner on the way to the pub in this little village outside of Totnes (a 700 year old thatch roofed pub of course), we walked by Rob’s house and he popped out to say hi, which was a bit funny and surreal. The next day after lunch and a brief bike tour around town, I sat for a bit in the small upstairs office with Rob working on the soon to be released Transition Companion book, Ben coordinating with initiatives while others prepped for the conference, worked on the next generation of transition trainings and a soon to be released Transition film. I also felt acutely aware of this small and joyful but hard-working team of people sitting gracefully in the center of growing global interest with visitors and media from all over the world seeking to rub up against a bit of their transition magic. After a 9-hour mini bus ride from Totnes with the Transition team, we arrived in Liverpool. From Peter Lipman and Rob Hopkins’ opening words about the growing crises that inspired the emergence of the Transition Movement (now with 375 initiatives and over 400 mullers around the world), to rushing off to the train station on Monday, it was an electric, eclectic weekend of connection, laughter, learning and traversing every landscape from personal resilience to dreaming these solutions at scale. From stories of transformation in Brazilian Favelas to rapid Transition responses in a New Zealand earthquake to transitioners from a dozen countries sitting in a circle realizing the importance of this moment and our need to kick our network of Transition hubs up a notch, the maturing of this young movement was deeply felt in many inspiring ways. Most days tending our urban homestead, Daily Acts and Transition U.S. feels like quite enough. So plugging in to this larger transition community leaves me feeling filled with equal parts boundlessness, gratitude, humility and trepidation. But this deep in my bones sense of connection to this emerging movement, allied efforts and each one of you is soooo worth it. Whether you are amidst stress and struggles, celebration and success or all of it, pause for a moment and close your eyes. Step outside and put your feet on the earth or reach up and plug your finger into the sky. Feel warmed by the shine of this movement, fed by our momentum and blessed by what small but essential contribution you are called to contribute to transition in this amazing, uncertain time. As the conference came to a close, one attendee quoted William Gibson saying “The future is already here, it’s just not very evenly distributed yet.”, while another reminded us of the gift of uncertainty. If we were certain things would work out, we would probably slip into comfort and complacency. If we were certain they wouldn’t, apathy and inaction. But here we sit on the cusp of so much, in perfect uncertainty, knowing that with the right effort, in the right place, at the right time anything is possible…and possibly probable when we live as if it’s so. Trathen Heckman is President of Transition US and the founding executive director of Daily Acts Organization, publisher of Ripples, an award-winning journal and a backyard farmer. He is the former executive director and a board member of Green Sangha Organization. Seeking to inspire the engagement of hearts, minds and senses, Trathen educates and works with community, business and municipal leaders to create programs, policy and models which harness the power of nature and inspired action to restore the health of our lives and communities. Trathen has given oodles of local, national and international presentations on sustainability, Permaculture, ecological design and the power of our daily actions to renew the world. He lives in the Petaluma River Watershed where he grows food, medicine and wonder while working to compost apathy and lack.